There aren't enough food, service, value or atmosphere ratings for Burger King, South Carolina yet. Be one of the first to write a review! Our WHOPPER® Sandwich Meal is a ¼ lb. 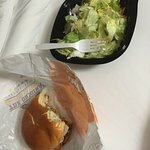 of savory flame-broiled beef topped w/ juicy tomatoes, fresh cut lettuce, creamy mayonnaise, crunchy pickles, & sliced white onions on a soft sesame seed bun. Served w/ a small side of piping hot, thick cut French Fries or golden Onion Rings & a small fountain drink of your choice to make it a meal. Our DOUBLE WHOPPER® Sandwich Meal is a pairing of two ¼ lb. savory flame-broiled beef patties topped w/ juicy tomatoes, fresh cut lettuce, creamy mayonnaise, crunchy pickles, & sliced white onions on a soft sesame seed bun. Served w/ a small side of piping hot, thick cut French Fries or golden Onion Rings & a small fountain drink of your choice to make it a meal. Our TRIPLE WHOPPER® Sandwich Meal boasts three ¼ lb. savory flame-broiled beef patties topped w/ juicy tomatoes, fresh cut lettuce, creamy mayonnaise, crunchy pickles, & sliced white onions on a soft sesame seed bun. Served w/ a small side of piping hot, thick cut French Fries or golden Onion Rings & a small fountain drink of your choice to make it a meal. Our WHOPPER JR.® Sandwich Meal features one savory flame-broiled beef patty topped w/ juicy tomatoes, fresh cut lettuce, creamy mayonnaise, crunchy pickles, & sliced white onions on a soft sesame seed bun. Served w/ a small side of piping hot, thick cut French Fries or golden Onion Rings & a small fountain drink of your choice to make it a meal. Boasting two flame-broiled beef patties, one slice of melted American cheese, thick cut hardwood smoked bacon, our made to order BK® Double Stacker Meal is smothered in zesty BK® Stacker sauce & held together by a toasted bun. Served w/ a small side of piping hot, thick cut French Fries or golden Onion Rings & a small fountain drink of your choice to make it a meal. Our TENDERCRISP® Chicken Sandwich Meal is a premium white meat chicken fillet generously breaded w/ homemade seasoning & carefully layered w/ fresh lettuce, ripe tomatoes, & creamy mayonnaise between an artisan-style bun. Served w/ a small side of piping hot, thick cut French Fries or golden Onion Rings & a small fountain drink of your choice to make it a meal. Our TENDERGRILL® Chicken Sandwich Meal is a juicy premium white meat chicken fillet carefully layered w/ shredded lettuce, ripe tomatoes, & creamy mayonnaise between an artisan-style bun. Served w/ a small side of piping hot, thick cut French Fries or golden Onion Rings & a small fountain drink of your choice to make it a meal. Our Original Chicken Sandwich Meal is a lightly breaded premium white meat chicken fillet topped w/ a simple combination of shredded lettuce & creamy mayonnaise on a sesame seed bun. Served w/ a small side of piping hot, thick cut French Fries or golden Onion Rings & a small fountain drink of your choice to make it a meal. Our Premium‏ Alaskan Fish Sandwich Meal is a light & flaky 4.3 oz. 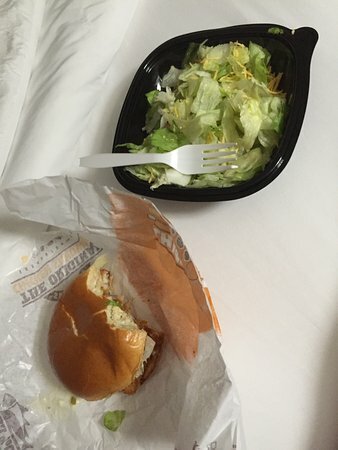 cold water white fish fillet topped w/ tangy tartar sauce & shredded lettuce on a corn-dusted bakery-style bun. Served w/ a small side of piping hot, thick cut French Fries or golden Onion Rings & a small fountain drink of your choice to make it a meal. Made w/ premium white meat chicken, our three-piece & five-piece Chicken Strips Meal is marinated & generously battered in seasoned home-style breading. Be our guest & dip them into one of our bold or classic sauces. Served w/ a medium side of piping hot, thick cut French Fries or golden Onion Rings & a medium fountain drink of your choice to make it a meal. Our Carolina BBQ WHOPPER® Sandwich is a ¼ lb of savory fire-grilled beef, topped w/ naturally smoked thick-cut bacon, pepper jack cheese, freshly cut iceberg lettuce, red onions & ripe tomatoes, smothered w/ a sweet southern sauce & the tang of Carolina BBQ sauce, all on a warm, toasted sesame seed bun. Our WHOPPER® Sandwich is a ¼ lb. of savory fire-grilled beef topped w/ juicy tomatoes, fresh cut lettuce, creamy mayonnaise, crunchy pickles, & sliced white onions on a soft sesame seed bun. Served w/ a small side of piping hot, thick cut French Fries or golden Onion Rings & a small fountain drink of your choice to make it a meal. Our DOUBLE WHOPPER® Sandwich is a pairing of two ¼ lb. savory fire-grilled beef patties topped w/ juicy tomatoes, fresh cut lettuce, creamy mayonnaise, crunchy pickles, & sliced white onions on a soft sesame seed bun. Served w/ a small side of piping hot, thick cut French Fries or golden Onion Rings & a small fountain drink of your choice to make it a meal. Our TRIPLE WHOPPER® Sandwich boasts three ¼ lb. savory fire-grilled beef patties topped w/ juicy tomatoes, fresh cut lettuce, creamy mayonnaise, crunchy pickles, & sliced white onions on a soft sesame seed bun. Served w/ a small side of piping hot, thick cut French Fries or golden Onion Rings & a small fountain drink of your choice to make it a meal. Our WHOPPER JR.® Sandwich features one savory fire-grilled beef patty topped w/ juicy tomatoes, fresh cut lettuce, creamy mayonnaise, crunchy pickles, & sliced white onions on a soft sesame seed bun. Served w/ a small side of piping hot, thick cut French Fries or golden Onion Rings & a small fountain drink of your choice to make it a meal. Boasting one fire-grilled beef patty, one slice of melted American cheese, thick cut hardwood smoked bacon, our made to order BK® Single Stacker is smothered in zesty BK® Stacker sauce & held together by a toasted bun. Boasting two fire-grilled beef patties, one slice of melted American cheese, thick cut hardwood smoked bacon, our made to order BK® Double Stacker is smothered in zesty BK® Stacker sauce & held together by a toasted bun. Served w/ a small side of piping hot, thick cut French Fries or golden Onion Rings & a small fountain drink of your choice to make it a meal. Boasting three fire-grilled beef patties, two slices of melted American cheese, thick cut hardwood smoked bacon, our made to order BK® Triple Stacker is smothered in zesty BK® Stacker sauce & held together by a toasted bun. Try our‏ Hamburger, a signature fire-grilled beef patty topped w/ a simple layer of crinkle cut pickles, yellow mustard, & ketchup on a toasted sesame seed bun. Make room‏ for our Double Cheeseburger, two signature fire-grilled beef patties topped w/ a simple layer of melted American cheese, crinkle cut pickles, yellow mustard, & ketchup on a toasted sesame seed bun. A juicy fire-grilled premium white meat chicken fillet topped w/ melted mozzarella cheese, freshly chopped iceberg lettuce, ripe tomatoes, & a flavorful creamy Italian basil sauce, all on a warm toasted whole wheat artisan style bun. Also available w/ Crispy Chicken. Our TENDERCRISP® Chicken Sandwich is a premium white meat chicken fillet generously breaded w/ homemade seasoning & carefully layered w/ fresh lettuce, ripe tomatoes, & creamy mayonnaise between an artisan-style bun. Our TENDERGRILL® Chicken Sandwich is a juicy premium white meat chicken fillet carefully layered w/ shredded lettuce, ripe tomatoes, & creamy mayonnaise between an artisan-style bun. Our Classic CHICK'N CRISP® Sandwich is loaded w/ chopped lettuce, a light layer of creamy mayonnaise, & served to you freshly prepared on a perfectly toasted sesame seed bun. Our Spicy CHICK'N CRISP® Sandwich is loaded w/ chopped lettuce, a layer of original firecracker sauce, & served to you freshly prepared on a perfectly toasted sesame seed bun. Our Original Chicken Sandwich is a lightly breaded premium white meat chicken fillet topped w/ a simple combination of shredded lettuce & creamy mayonnaise on a sesame seed bun. Our Premium Alaskan Fish Sandwich Meal is a light & flaky 4.3 oz. 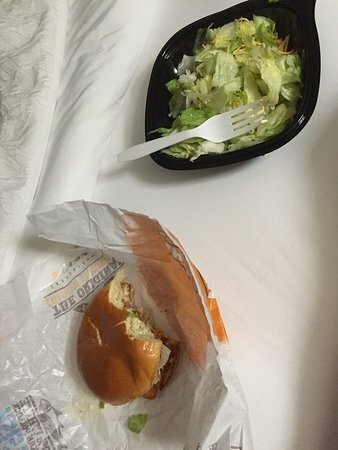 cold water white fish fillet topped w/ tangy tartar sauce & shredded lettuce on a corn-dusted bakery-style bun. Served w/ a small side of piping hot, thick cut French Fries or golden Onion Rings & a small fountain drink of your choice to make it a meal. Our BK VEGGIE® Burger is a MorningStar Farms® Garden Veggie Patties™ Veggie Burger topped w/ fresh lettuce, juicy tomatoes, creamy mayonnaise, & ketchup between a toasted sesame seed bun. Our chicken, apple & cranberry garden salad wrap perfectly blends seven premium lettuces, crisp apples, Sweet dried cranberries, crumbly blue cheese & ken’s apple cider vinaigrette topped w/ your choice of crispy or Grilled chicken wrapped in a wheat tortilla. Our chicken BLT salad wrap perfectly blends seven premium lettuces, including romaine, spring mix & Iceberg, & is garnished w/ thick cut hardwood smoked bacon, ripe tomatoes, zesty red onions, ken’s avocado ranch Dressing & a three-cheese medley w/ your choice of crispy or grilled chicken wrapped in a wheat tortilla. Our chicken caesar garden salad wrap is a wonderful medley of romaine lettuce, juicy tomatoes, shaved Parmesan cheese & ken’s citrus caesar vinaigrette topped w/ your choice of crispy or grilled chicken wrapped in a wheat Tortilla. Premium white meat chicken w/ mozzarella cheese, freshly chopped iceberg lettuce, ripe tomatoes, And a flavorful creamy italian basil sauce, wrapped in a flour tortilla. Our chicken, apple & cranberry garden fresh salad perfectly blends seven premium lettuces, crisp apples, Sweet dried cranberries, & crumbly blue cheese. Served w/ ken’s apple cider vinaigrette & topped w/ your Choice of juicy tender crisp or tendergrill chicken. Our chicken BLT garden fresh salad perfectly blends seven premium lettuces, including romaine, spring Mix & iceberg, & is garnished w/ thick cut hardwood smoked bacon, ripe tomatoes, zesty red onions, & a three- Cheese medley. Served w/ ken’s avocado ranch dressing & topped w/ your choice of juicy tender crisp or tender grill Chicken. Our chicken caesar garden fresh salad is a wonderful medley of romaine lettuce, juicy tomatoes, home- Style parmesan croutons, & shaved parmesan cheese. Served w/ ken’s citrus caesar vinaigrette & topped w/ Your choice of juicy tender crisp or tender grill chicken. Also available as a side salad without chicken. Our garden side salad is a blend of seven premium lettuces garnished w/ juicy tomatoes, home-style Croutons, a three-cheese medley, & your choice of ken’s salad dressing. Nutrition information does not reflect Home-style croutons or ken’s salad dressing. Our ranch crispy chicken wrap combines seven premium lettuces, marinated all white meat chicken, a Three-cheese medley, & ken’s ranch dressing all wrapped in a delicious white flour tortilla. Our honey mustard crispy chicken wrap combines seven premium lettuces, marinated all white meat Chicken, a three-cheese medley, & ken’s honey mustard dressing all wrapped in a delicious white flour tortilla. Poppable pieces of premium, white-meat chicken breast, w/ a flavorful, seasoned crunchy outside & Served w/ your choice of our delicious dipping sauces. Eight delicious dipping sauces to choose from: BBQ, jalapeño BBQ, Honey mustard, ranch, zesty, buffalo, sweet & sour, kung pao. Made w/ premium white meat chicken, our bite-sized chicken nuggets are lightly battered in seasoned Home-style breading & perfect for dipping into one of our bold or classic sauces while on the go. Choose from a four-piece, Ten-piece, or twenty-piece pack. Eight delicious dipping sauces to choose from: BBQ, jalapeño BBQ, honey mustard, Ranch, zesty, buffalo, sweet & sour, kung pao. Nutrition information reflects 10 piece serving. Sweet & savory alternative to our french fries, served hot & freshly prepared, they are the perfect Combination of salty & sweet. Enjoy the crispy outside & the tender sweetness on the inside. Limited time only. Served hot & crispy, our golden onion rings are the perfect treat for plunging into one of our bold or Classic sauces. Our apple slices are naturally sweet, fresh-cut apple slices which provide a deliciously nutritious full Serving of fruit. Came here for a quick bite service slow, had the King box $6.00 not bad. What more can I say? Drive thru was busy maybe that's why counter was slow. No dressing. No napkins. Really!! And the girls working the voice box was whispering! I asked several times..What??? Go somewhere else. Chic fil A?? 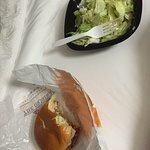 I have preferred Burger King over McDonald's in some locations and this is definitely one of the better locations.Fast friendly service with food served hot. Very clean restrooms. Very clean interior. Would definitely recommend.